This is a very serious autoimmune disease that affects the bone joints primarily. Statistics reveal that almost 50 people newly develop this disorder in every 100,000 people. The disorder is somewhat different from osteoarthritis. Rheumatoid Arthritis (RA) is believed to occur at a relatively younger age (30-50 years) than osteoarthritis. When the disorder occurs at a much younger age, it is known as juvenile arthritis. The source of pain is also quite different. While osteoarthritis is caused due to cartilage degeneration, rheumatoid arthritis is caused due to the improper action of immune system on the lining of the joint (synovium). If osteoarthritis is treated with NSAIDS and other antibiotics, medicines of much higher doses like steroids are often administered for rheumatoid arthritis. In addition, they might need some medication that deters bone damage. The affected areas in both these disorders are slightly different. 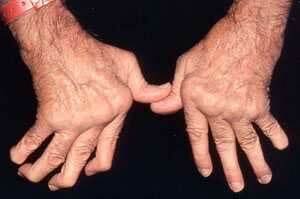 Rheumatoid Arthritis primarily affects the smaller joints first. In contrast, it is the much larger areas (like knees and hips) that are affected in the case of osteoarthritis. The deformities shown also are of some difference. Osteoarthritis is said to produce painful body masses in the associated areas. In the case of rheumatoid arthritis, joint deformities are more prominent. Formation of nodules under skin surface is a very noticeable feature of rheumatoid arthritis. There are no such masses related with osteoarthritis. It is seen that rheumatoid arthritis frequently affects female rather than males. Osteoarthritis, however affects both the genders equally. There is also not much relation between immune system action and osteoarthritis. Another major differentiating feature is the rate of progression and onset. Osteoarthritis is said to progress in a much uniform and slower manner. Rheumatoid arthritis on the other hand flares up all of a sudden and can progress at a much quicker rate. Also, the duration of morning stiffness is also different. A sensation of stiffness in the early morning hours is seen for a relatively much longer time in the case of rheumatoid arthritis. The disorder is also said to have a negative impact on the life span. This may be due to its association with the immune system. However, no special relation exists between osteoarthritis and age. The signs and symptoms of rheumatoid arthritis may differ from person to person. The main symptoms are inflammation, swelling, and pain in the affected areas. There is a chance of getting a low grade fever. The patient may lose appetite, feel tired and may also become anemic. Rheumatoid arthritis can be diagnosed through several ways. These include the use of imaging techniques (X-rays of feet and hands in particular), blood tests etc. Usage of disease modifying agents: This special drug category for the treatment of rheumatoid arthritis is named as Disease Modifying Anti-rheumatic Drugs (DMARD). They are mostly administered in the primary stages of the disease. Methotrexate is one among them. Usage of Anti inflammatory agents: NSAIDS fall into this category and are used for to achieve relief from stiffness and pain. Lifestyle: This includes performing daily exercises to increase the strength of muscles. Exercises also help in maintaining the totality of physical functions. Other management techniques include dietary supplements, alternative medicines etc. Dr. Prabhudev K.B is one of the well-known orthopaedic surgeons in the country. He has done MS in Orthopaedics and currently serves as an orthopaedic surgeon at MSSC.